Navajo silversmith Carmelita Simplicio is best known for her rings and bracelets made in a style common to Navajo jewelry of the 1960's and 1970's. Her pieces are most often set with classic blue Kingman turquoise, sometimes in combination with Mediterranean red coral. This is a large, hefty single-piece shank set with a stone of natural, untreated Kingman turquoise in combination with a free-form piece of deep crimson Mediterranean red coral. Hallmarked SIMPLICIO and stamped STERLING inside. 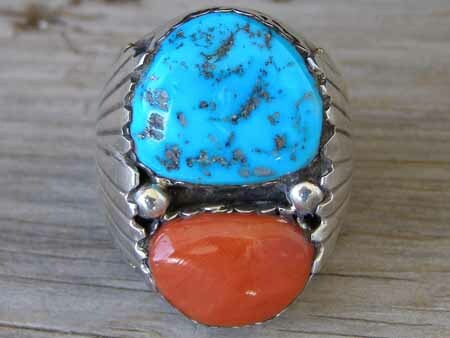 Kingman turquoise: 13/16" x 11/16"
Red coral: 11/16" x 1/2"
Ring face: 1 3/8" x 7/8"